All roads again lead to Cheltenham in March for Sizing John, who made light work of beating dual race winner and favourite Djakadam by seven lengths, although the exact route the 2-1 winner takes to the Festival has yet to be determined. With the future in mind, Harrington's decision to skip last month's Betfair Chase at Haydock over three miles on heavy ground - and with it the chance of a £1million bonus for adding the 32Red King George VI Chase and Timico Cheltenham Gold Cup - almost certainly looks to have been the right one. 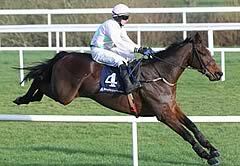 Robbie Power was content to track Djakadam throughout the early part of the two-and-a-half-mile Grade One contest following an uncharacteristic blunder at the second fence, with his charge faultless thereafter and the rider cutting a confident figure swinging for home. The seven-year-old took over approaching three out and quickly put matters to bed, easing clear on the run-in. Harrington said: "First run of the year, you are always nervous. I wasn't worried about the heavy ground going two and a half miles, but he was super. The mistake at the second fence woke us all up and he jumped super after that. "He's a super jumper and it's the first time he's made a mistake in all the races that I've been training him. He doesn't mind heavy ground, not going two and a half miles - it's just going three miles would bottom him out a fair amount. "I don't know where he will go next. It's always one race at a time and I'll have to talk to a few people before we decide where we go next." She added: "The one place he will turn up, all things being equal, is in March (Cheltenham), and what we do between now and March will depend on the horse. 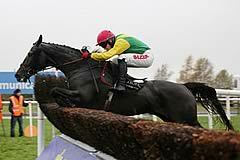 We might go to Leopardstown or the King George or we might miss Christmas altogether." The winner, who runs in the colours of the late Alan and Ann Potts, was cut to 4-1 favourite from 6-1 by Ladbrokes for a Cheltenham repeat. "The last few weeks he's really come to himself and Jessie deserves the credit for not going to Haydock, that was good for the horse. The ground was heavy enough for him out there, but he just jumped an travelled. "From the second fence on I was always in cruise control. At one fence down the back he took two lengths out of Djakadam. He was just very good. "Djakadam has won this race for the last two years and he's a good horse over two and a half miles, so we weren't going to let him dictate. "Fingers crossed we can keep him right." Willie Mullins made no excuses for Djakadam and was quick to pay tribute to Harrington's ace. He said: "Djakadam ran grand, but it was a great performance from Sizing John. "We'll have to find a new target for him and I'd say he will go for the Lexus (Leopardstown Christmas Chase, December 28) at Christmas."